In our house, Saturday is baking day. The warmth of the kitchen and the sweet smell of cinnamon and nutmeg baking seem to make the cold winter months a bit more bearable. This loaf is quite easy to assemble and most of the ingredients are usually kept on hand (if your needing a quick treat that can be whipped up in no time). The addition of orange juice makes for an interesting twist. If you have an orange on hand, zest a teaspoon or two into the batter for a lovely burst of extra citrus flavor. On occasion , I’ve added a half cup of finely chopped dates to the batter for added moisture and flavor. Using smaller loaf pans, I often make several loaves to give away as gifts. Friends and family always enjoy a special homemade treat for the kitchen. Preheat the oven to 350 degrees. Spray, with cooking spray, a 9×5″ loaf pan. In a large bowl, cream together the butter, sugar, and eggs. Mix in pumpkin and orange juice. In another bowl, mix together the flour, baking powder, baking soda, salt, cinnamon, cloves and nuts. Mix dry ingredients into wet ingredients stirring just until completely moistened. Pour into the prepared loaf pan. Bake for 55-60 minutes in the preheated oven, or until an toothpick inserted comes out clean. Cool in pan 10 minutes. Remove loaf and cool completely on wire rack. When I was first married, I used to spend my Saturday mornings running to local garage sales looking for various pieces of furniture, dishes, baking pans, etc., to fill our new home. My husband worked his share of Saturday hours, so I would plan to visit what I felt were the best sales in our historic Chicago neighborhood while he was away. Browsing through the garage sale items, I loved looking for unique old baking pans and muffin trays. Many had unusual patterns or were made of great, durable materials. They had a quality that was unmatched when comparing current brands on the market. Kitchen utensils from years gone by also caught my attention. Depression glassware and Fiestaware were my favorites and I collected every piece I could find. My garage sale days are over now but when all was said and done, over the years I had collected, among other things, nearly twenty loaf pans for baking quick breads, meatloaf, Irish soda bread, and yeast breads. You may wonder how it is that I have use for such an amount of baking pans. Well, I like to bake things in large quantities. I often bake several batches of cookies, muffins or loaves of bread so that I can do it once, wrap it, freeze it, and have a supply on hand for a good while. 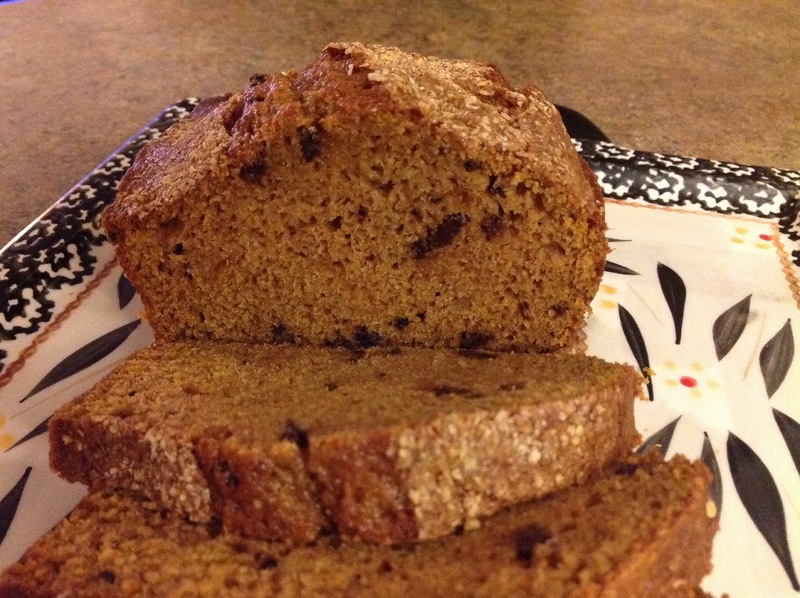 This recipe for pumpkin bread freezes just perfectly. While the loaf is moist and flavorful fresh out of the oven, it seems even better after it is frozen and thawed from the freezer. 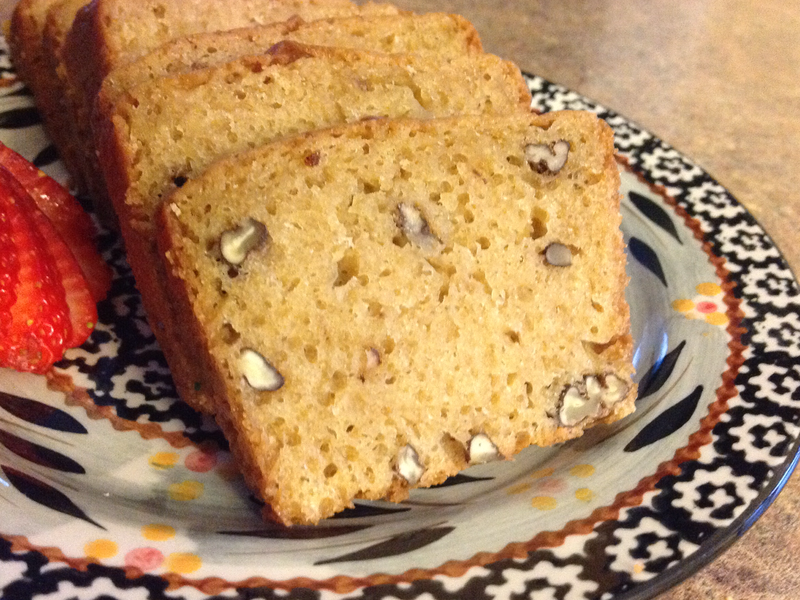 I like to switch up the dried fruit in the loaf, often using whatever is on hand. Great substitutes include raisins, currants, diced pineapple or finely chopped apples. Mix up the nuts too, if you’d like, chopped pecans work great in this recipe. 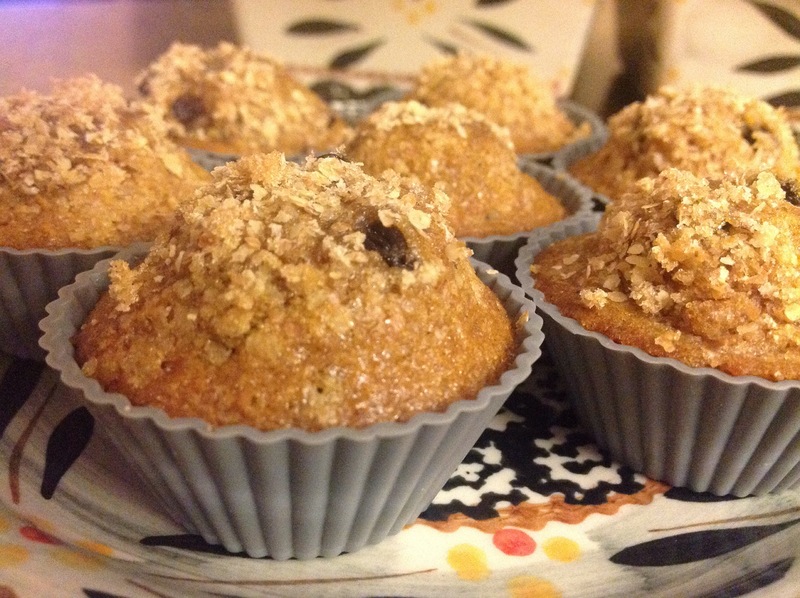 If you prefer muffins, scoop batter into paper lined mini-muffin pans and sprinkle with wheat germ. Bake 12-14 minutes at 350 degrees. Preheat oven to 350 degrees. Spray with cooking spray, 2-9X5″ loaf pans. In a large bowl, combine wet ingredients, add sugar and mix until well blended. Whisk together the flour, baking soda, salt, cinnamon, nutmeg, cloves and ginger in a separate bowl. Stir in nuts and dried fruit. Pour into the pumpkin mixture; mix until just blended. Pour into the prepared pans. Sprinkle wheat germ evenly over batter. Bake for 50-55 minutes in the preheated oven, or until toothpick inserted in center comes out clean. Well, it’s been one year since I starting this blogging adventure and I am just thrilled to celebrate my first anniversary with Simply Made Kitchen and Crafts. What I enjoy most about the WordPress experience is certainly not what I expected it would be. You see, I never realized how many wonderful people I would “meet” through the blog. There are certain blogger posts that I so enjoy reading. Two of which are — Dani’s blog at teddyandtottie.com and Shanna’s blog, Curls and Carrots, at shannaward.com. Shanna, mother of two adorable children, is always whipping up a batch of something wonderful (and super healthy). She is a talented writer and is incredibly supportive to fellow bloggers. I am grateful that I found her through the daily newsfeed. I simply adore Dani’s blog (teddyandtottie.com) about family, crocheting, gardening, pets and everyday life in Australia. She, too, is a talented writer and her words seem to jump from the page to take me clear across the globe into her everyday world. Thank you both, Shanna and Dani, for your kindness and support. When I first graduated from college, I worked in the garment/fashion industry in the city of Chicago. I was employed by a very talented clothing designer and I very much enjoyed the task of ordering fabric and notions, communicating with retail customers, following production and making sure that finished ordered were shipped to satisfied customers. We were a small staff of fifty or so and it often felt like we were a family. One of the young pattern makers brought in a batch of these bars during the holidays some twenty or so years ago. After one bite, I asked for the recipe. She stood at her pattern-making table and wrote out (from memory) the recipe on an index card. I still have the very same recipe card, beautifully written in perfectly formed letters. Every time I make this recipe, I think of my early years, fresh out of college…boy, how time flies! Preheat oven to 350 degrees. In a medium bowl, mix the eggs, sugar, oil, and pumpkin with an electric mixer until light and fluffy. Sift together the flour, baking powder, baking soda, pumpkin pie spice and salt. Stir into the pumpkin mixture until thoroughly combined. Spread the batter evenly into a lightly greased 10×15 inch jellyroll pan. Bake for 25 to 30 minutes in preheated oven. Cool before frosting. To make the frosting, cream together the cream cheese and butter. Stir in vanilla. Add confectioners’ sugar a little at a time, beating until mixture is smooth. Drizzle or frost completely spreading evenly on top of the cooled bars. Top with chopped walnuts. Cut into squares. A great sale on canned pumpkin has got me looking through my clippings and notebooks for recipes that include pumpkin purée. When I stumbled across this recipe for pumpkin corn bread muffins, I thought it might be the perfect recipe to revisit. 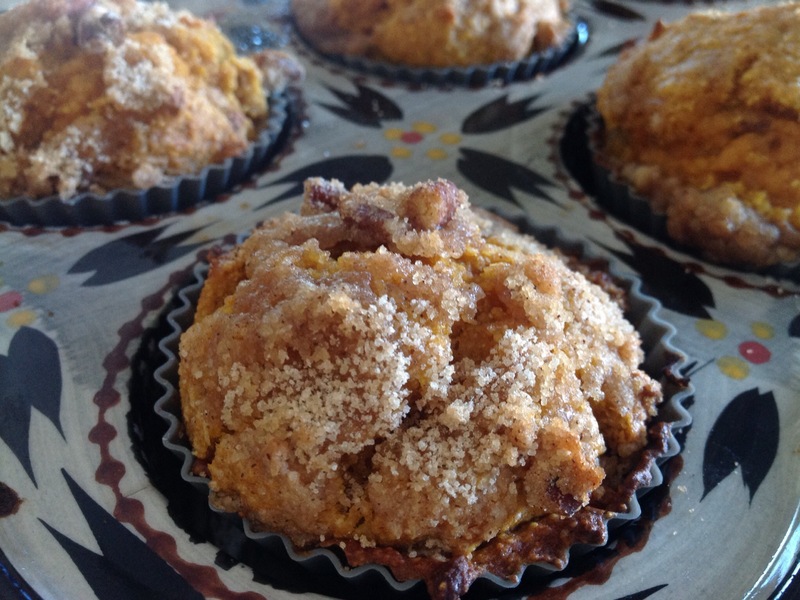 Corn meal and pumpkin purée add an interesting texture to these moist muffins and this is another great recipe that packs well in the lunchbox. 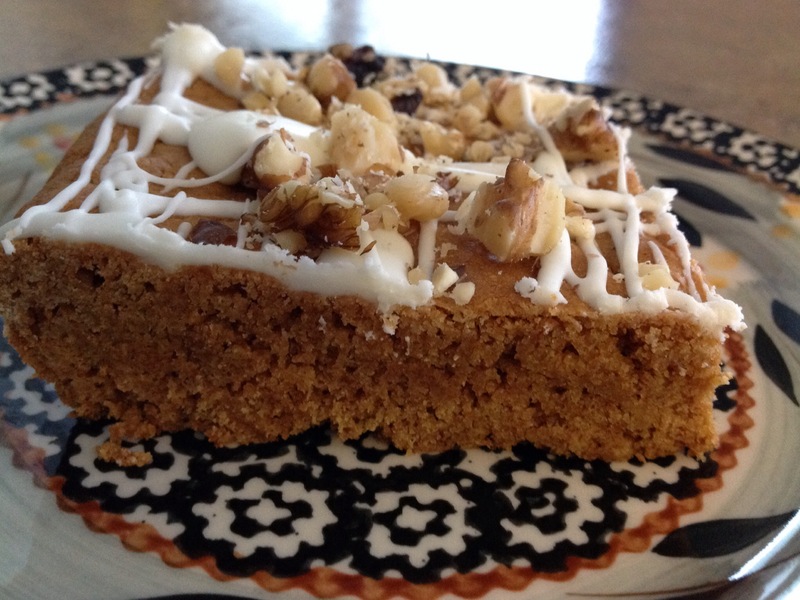 I often add a crunchy cinnamon topping to the recipe just before baking. This is completely optional but it adds sweetness and texture to the outside of the muffin making it taste more like a sweet bread. It also tastes great with a cup of tea or coffee when you’re looking for a quick breakfast item. Preheat oven to 425 degrees. Grease muffin cups or line with paper muffin liners. In a large bowl, stir together flour, cornmeal, baking powder, baking soda, cinnamon and salt. In a small bowl, stir together the eggs, pumpkin, sugar, vanilla, milk and oil. Make a well in the center of the dry ingredients and pour in the egg mixture. Stir until blended; do not over mix. Fold in pecans. Divide the batter evenly among prepared muffin tin cups. To make topping, mix together brown sugar, flour, and cinnamon. Cut in butter with a fork. Sprinkle evenly over muffin tops. Bake in preheated oven for 15 to 18 minutes, until a toothpick inserted into center of a muffin comes out clean.